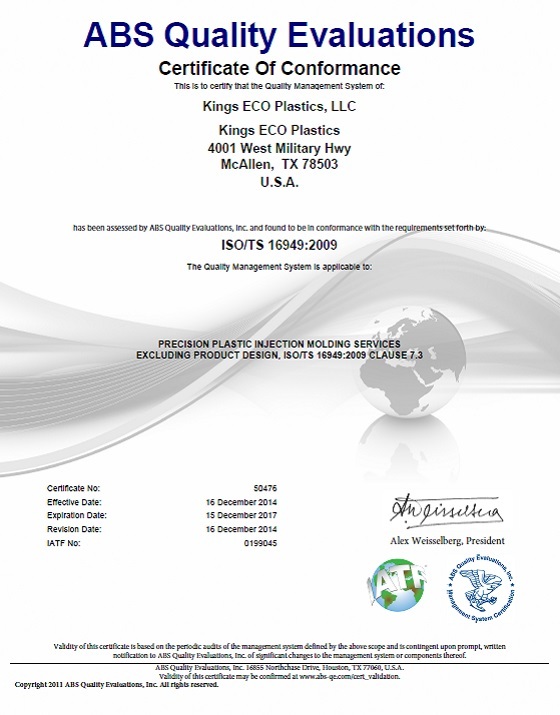 The King's ECO Plastics team firmly believes in defect-free parts and a clean manufacturing environment. This is our credo and we abide by this every day and we have been certified to prove it. We take steps each day to ensure we live up to that standard, and we have earned the certification to show it. Our certified custom injection molding facilities in McAllen, Texas meet the toughest industry standards. Our quality labs use automated video measuring machines for quick turnaround of initial sample inspection reports ISIR and production part approval process (PPAP) documentation. WBENC. The Women's Business Enterprise National Council is the largest third-party certifier of businesses owned, controlled, and operated by women in the United States. UL Certified Injection Molder. UL Standards develops and publishes standards and specifications for products having a bearing on fire, life safety and security, crime prevention, energy efficiency, environmental safety, security of assets and facilities, live working and workplace safety and other areas.